In what would seem an almost unbelievable move, were it not Thailand, the poultry company Thammakaset, which was last month ordered by the Supreme Court to pay 1.7 million baht to migrant Burmese workers whom IT abused…is now trying to get them into jail. At Don Muang court in Bangkok today the company laid criminal charges against 14 migrant workers for criminal defamation against the former workers. The motive – well it’s difficult to see anything other than spite for the loss of face they were subjected to. The company will not get its cash back but presumably want the defendants to spend all the cash they have been awarded, to defend themselves. They could even go to jail if the court is influenced, as these are charges carrying a jail sentence of up to 18 months. They will almost certainly stop the defendants returning to their homes in Burma but today at the court they were each bailed in the sum of 20,000 baht. Judging by the photo below from their legal team they are well represented. And present at the hearing were representatives of the Finnish, Swedish and Netherlands Embassies and also from the UNHCR. In this foot shooting exercise it looks like the migrant workers will not have to dig into their own pockets. Here’s the statement from the Migrant Workers Rights Network. Thammakaset Company Ltd. filed criminal prosecutions against the 14 workers in October 2016, alleging offences of criminal defamation and also giving false information to public officials in relation to the worker’s complaint in July 2016 to the National Human Rights Commission of Thailand (NHRCT). This complaint concerned alleged abuse at the Farm and the worker’s failure to receive an adequate remedy. If found guilty of these two offenses, under sections 137 and 326 of the Thai Criminal Code, the workers could be imprisoned for up to one and half years and/or fined up to 21, 000 Thai Baht (US$628). As best practice in accordance with the United Nation’s Guiding Principles on Business and Human Rights (UNGP on BHR), two Nordic poultry importers and a Thai poultry exporter will cover bail costs for the 14 workers up to €15,000 (588, 000 Thai Baht). Following arrest, indictment and pleas of not guilty at today’s court hearing, this contribution should ensure the workers are immediately released temporarily from detention on bail pending a full criminal trial, with potential additional conditions on freedom of movement overseas imposed by the Court. The full trial of the workers is expected to commence in November 2017. Previously on 14th September 2017, Thailand’s Supreme Court dismissed Thammakaset’s second and final appeal requesting overturning of a 1st August 2016 compensation order by Lopburi Department of Labour Protection and Welfare (DLPW) requiring 1.7 million Thai baht (US$52, 000) in past wages be paid by the farm to the 14 workers concerning their alleged abuse. The workers will receive this compensation in the coming days. The worker’s own litigation filed in September 2016, claiming 44 million baht (US$1.25m) in damages and compensation for abuses suffered, remains pending a final ruling of the Supreme Court, expected later this year. Thammakaset 2 farm was previously contracted to supply poultry for export by Betagro Group and for this reason the worker’s compensation claim was filed against both Thammakaset Farm, Betagro as well as Lopburi DLPW officials. The 14 workers consider the 2016 DLPW order doesn’t award them adequate compensation for up to 5 years of abusive work conditions at Thammakaset. The workers alleged working days up to 20 hours and forced overtime including sleeping in chicken rearing areas overnight. Further, the workers alleged unlawful deduction of salaries, threats of further deductions, unlawful confiscation of identity documents and limited freedom of movement. Two of the workers were charged with multiple counts of theft from an employer, carrying up to seven years imprisonment if found guilty, following a police complaint filed by Thammakaset in June 2016. The complaint alleged time-cards were removed from the employer’s possession and given to DLPW officials as evidence of rights violations and long working hours. The case was recommended for prosecution by Lopburi Province police but was dropped following an order not to prosecute by the province’s Public Prosecutor’s Office. Thammakset however recently revived the case by filing new private theft prosecutions against the two workers at Lopburi Court, thereby side stepping public prosecution officials. In November 2016, Thammakaset filed criminal defamation and computer crimes litigation against former MWRN international affairs advisor Andy Hall at Bangkok South Criminal Court concerning his social media campaigning on the case. Hall left Thailand days after the prosecution citing inability to work amidst increasing judicial harassment as his reason. The imminent arrest of the 14 workers in this case has attracted considerable international concern including a statement by the United Nations (UN) Office of the High Commissioner for Human Rights and a joint open letter to the Thai Prime Minister by 87 businesses, civil society organisations, trade unions and members of the European Parliament. On two separate occasions, five UN Special Rapporteurs on Human Rights and the UN Working Group on Human Rights and Transnational Corporations have officially sent letters of allegation to the Thai Government given the human rights implications of the case. Statements on the case have been issued by Human Rights Watch and Fortify Rights, whilst in an unprecedented open letter, the EU’s Foreign Trade Association (FTA) called for an ‘Out of Court Settlement’ in response to increasing concern by its members, including European retailers and poultry importers. The International Trade Union Congress (ITUC) highlighted the case in an August 2017 submission on Thailand’s alleged ongoing breaches of ILO Convention 29 on Forced Labour to the ILO’s Committee of Expert in Geneva, Switzerland. Last week the Ethical Trading Initiative (ETI), representing the United Kingdom’s leading retailers, trade unions and civil society groups, was engaged in Bangkok in behind-the-scenes attempts to bring about a negotiated settlement to this dispute in advance of the 14 workers arrest today. Thai Tuna Industry Association members also previously provided humanitarian assistance, registration and employment for the 14 workers, who continue to work in Thailand’s seafood export sector following their resignation from Thammakaset in June 2016. The Thai Broiler Processing Exporters Association, whose membership includes both Thammakaset and Betagro, responded to pressure resulting from coverage of this case and overseas poultry buyer’s deepening concerns on labour conditions in the sector by launching with the DLPW and Department of Livestock Development a Good Labour Practices (GLP) initiative for the poultry industry in August 2016. However, at the same time in response to media coverage, the Director General of the DLPW denied the severity of abuses alleged by the 14 workers insisting the case was a labour dispute between workers and their employer and not one of forced labour, human trafficking, overwork or unlawful document retention. With no adequate remedy in sight from utilising the DLPW channels, the workers and MWRN therefore also petitioned the NHRCT in July 2016 requesting a review of the case. In its own report, relied on by Thammakaset in launching its criminal prosecutions against the workers, the NHRCT however backed up the DLPW position. With support from MWRN, the workers then submitted a pending complaint to the Lawyers Council of Thailand requesting the accuracy of and process of compiling and investigating the NHRCT report be investigated. 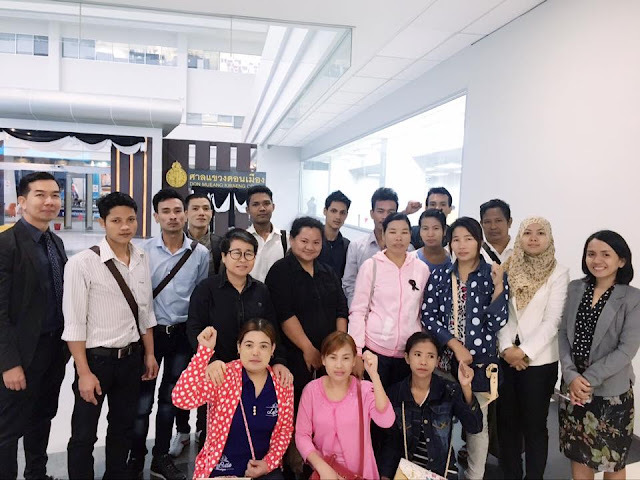 The Thammakset case continues at a time when Thailand’s migrant worker management and protection policies as well as human trafficking record are under increased global scrutiny. Thailand is the world’s 4th largest poultry exporter supplying chicken, often for use in processed or ready-made meals, mostly to European Union and Japanese markets. Thailand’s poultry export industry has come under increasing scrutiny for its poor labour conditions since 2015 research reports published by watchdog groups Finnwatch and Swedewatch.